If your like most new mothers, your preparation for motherhood starts as soon as you get that first confirmation of pregnancy. Between, doctors visits, child birthing classes and baby registries there is more than enough prep work to be done. But most parents, especially after the first week or so, will make it clear. No matter how much you try to prepare, its almost impossible to truly know what to expect until baby is actually born and you are actively parenting. That said, taking care to eat well after giving birth can help ease postpartum recovery and transition from pregnant to parenting. By getting plenty of rest, water and good food, you will give your body the fuel it needs to recover from pregnancy and childbirth and support lactation. Experts strongly recommend against dieting while breastfeeding because the postpartum woman needs an additional 300-500 calories to support healthy lactation. The source of these calories is also very important and most dietitians agree that a wholesome meal plan of nutrient dense foods is optimal for the breastfeeding duo. As a postpartum doula, I use Ali’s list as a general guide when preparing meal plans for my clients. I also take into account any allergies or dietary restrictions the family may have. What do you think of this list? 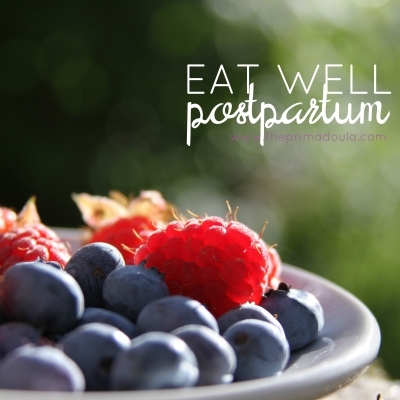 I’d love to hear your tips or recipes for healthy postpartum eating!